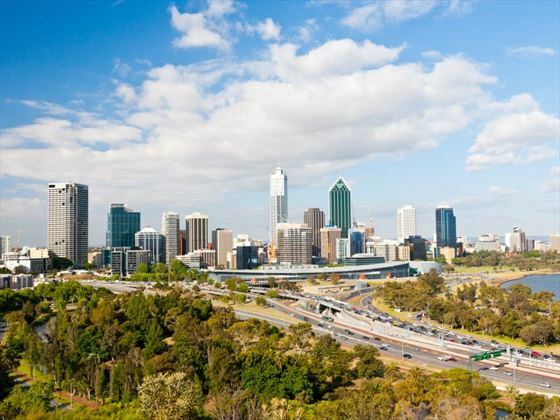 Arrive into Perth and meet with your tour guide and fellow travellers before setting off on a city tour of Perth, including visits to Kings Park and the Anzac Memorial. Afterwards, unwind and get to know your group with a welcome reception and dinner. Head east as you pass through Corrigin to Hyden, to enjoy a local guide on a tour of Boddington Gold Mine before continuing on to Wave Rock at lunch time. This superb rock formation resembles a vast wave and was formed by granite over three million years ago – it’s a fascinating sight and one not to be missed. Take a short walk to Hippo's Yawn and afterwards, why not explore the varied collections at the visitor’s cultural centre, including the largest collection of toy soldiers in the world. Continue on to Kargoorlie, which is edged by pretty spring flowers (seasonal) and stark ghost towns. Dine at your hotel this evening. In the morning take an exclusive farm tour to hear about live in the Outback - you can participate in the morning cattle feed and explore a private collectio of vintage cars. 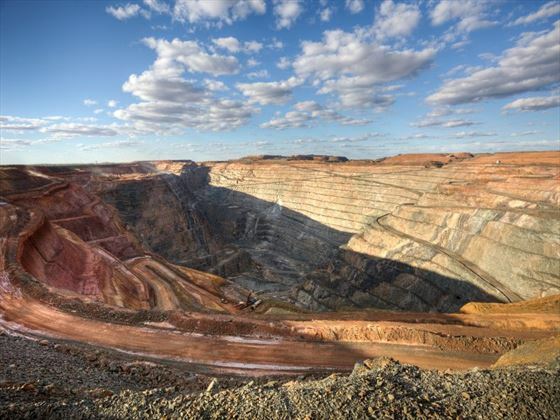 Late you’ll join a local guide to tour the Super Pit gold mine which produces up to 850,000 ounces of gold every year – this makes it the largest open-pit gold mine in Australia. After this fascinating tour, take an orientation tour of the gold mining town which is brimming with history and unique turn of the century buildings. Stop to look out over Lake Lefroy before eating at Kalgoorie's iconic pub, the Exchange Hotel. 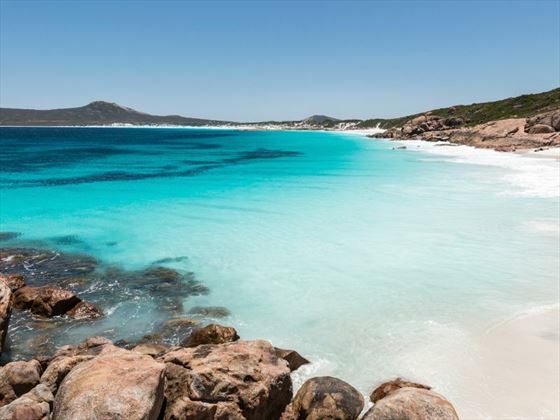 Visit the Cape Le Grand National Park for spectacular views of the wild coastal scenery and the mighty granite peaks, stopping along the way at the breath-taking Thistle Cove and Lucky Bay – one of the most picturesque bays in Australia. 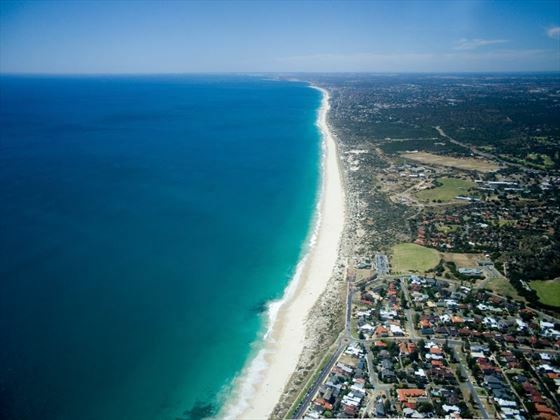 This area is known for its kangaroos which lounge on the beach in the sunshine. 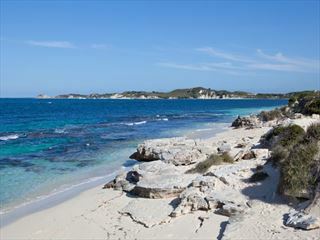 Spend the afternoon in Esperance, exploring at your own pace. Visit the magical pink lake today and travel through Ravensthorpe and the Fitzgerald Biosphere to Bluff Knoll Lookout, where you’ll be met with stunning views of the Stirling Ranges National Park. This is an incredibly rich area for flora, in fact its one of the best in the world, so don’t forget your camera. 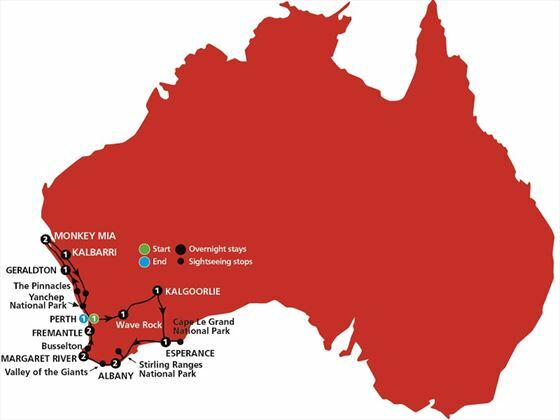 Afterwards, continue on to Albany – home of the Anzacs. Have some free time to explore the historic town and alter visit the National Anzac Centre which opened in 2014 - 100th anniversary for the first WWI convoys departing Australia. Visit the Valley of the Giants, filled with towering Tingle and Karri trees, stop here for lunch and to explore the canopy of the Tingle Forest with a treetop walk. In the afternoon visit Cape Leeuwin, where the Indian and Great Southern Oceans meet. Later on, visit the Cape Leeuwin Lighthouse which is found where the Indian and Great Southern Oceans meet.Opt to take a guided tour of the famous lighthouse. End the day in Margaret River which is the premier wine growing region in Australia. 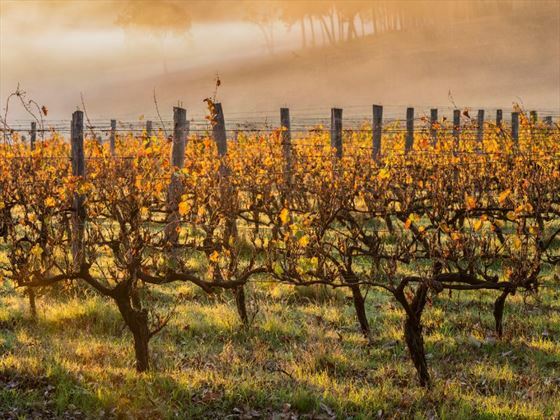 Today you’ll take a wine and olive oil tour of the Margaret River region, with tastings and lunch included. Spend the afternoon in a piteresque forest durrounded by karri trees where you will enjoy an afternoon tea, then make the most of some free time to explore. Travel north through Busselton on your way to Fremantle; upon arrival, discover the indigenous heritage of the area on a guided walking tour. The remainder of the day can be spent at leisure, perhaps with a visit to the Western Australia Maritime Museum where you can learn more about the maritime heritage of Fremantle. Alternatively, take in the sights on a replica tram, accompanied by a local commentary and the option to hop and off at the local sights. Enjoy a delicious meal at your hotel this evening. Enjoy a private tour of the Fremantle Prison this morning, you can picture how life was like for the prisoners. Spend some free time this afternoon making the most of the Fremantle markets, giving you the chance to shop for local arts and crafts, and culinary delights. 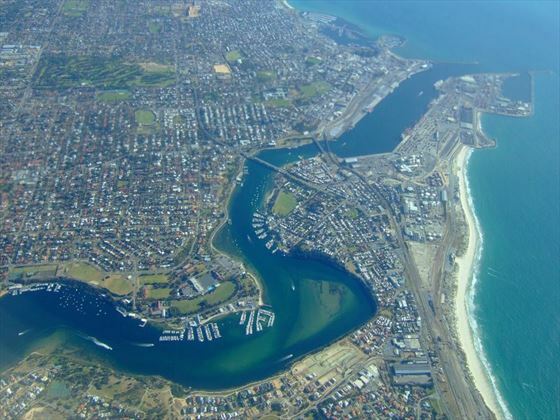 If you have some energy left and feel like doing something a bit more adventurous, take a boat trip to Rottnest Island or ride the historic Fremantle train. Journey across the rugged West Australian coastline today to the port of Geraldton, head up North to the Yanchep National Park where you'll enjoy a fantastic Aboriginal cultural experience in a Bush setting. You'll be treated to stories from a local who will share the enchanting sounds of the didgeridoo. At lunchtime head further along the coast to the seaside hamlet of Nambung National Park, home to the marvellous Pinnacles. On arrival you will have a chance to visit the HMAS Sydney memorial and discover the seaside township. Today is a fun-packed experience beginning with a visit to the Shark Bay World Heritage Discovery and Visitor Centre - many art displays, soundscapes and tales from those who have been part of this extraordinary place. 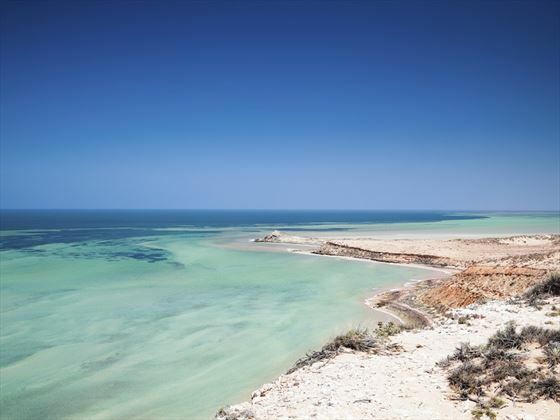 Travel to Hamelin Pool to see the worlds best known colony of Stromatolites - while they may not appear alive these living structures have helped scientists unravel the history of life on earth! Later visit the fascinating Shell Beach, one of only two in the world formed from billions of coquina bivalve shells up to ten metres deep. 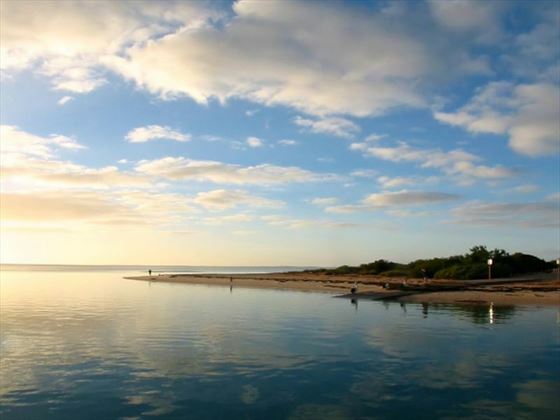 Continue onto Monkey Mia where you will stay for the next two nights. After a leisurely breakfast overlooking the calm shores of the bay, make the most of the staggering views today by watching the dolphins swim to shore along the coast. (These mammals are wild so there cannot be any guarantee of sightings). This is a day of leisure so why not go sailing with a picturesque cruise, soak up the sunshine on the beach or with a scenic flight over the coastline. In the evening there's nothing like sitting back with a cocktail or cool beer watching the world go by as the sun goes down over the water. 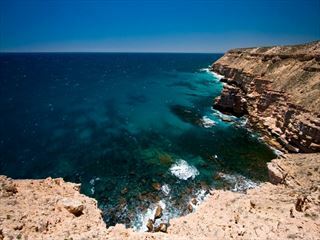 Today travel into the Kalbarri National Park and visit Red Bluff Lookout to see the spectacular scenery of Murchison River Gorge from the vantage point of Hawks Head. Keep an eye out for graceful Peregrine Falcons hunting along the gorges and cliffs. During wildflower season, the park is abloom with many a variety of wildflower. You'll spot Acacia, Banksia, Caladenia and many more! Tonight enjoy a dinner at your hotel. Travel today back to Perth to celebrate in the evening and share a few laughs as you recount your stories of your holiday together at the farewell group dinner. 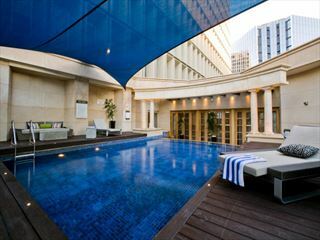 After breakfast you will be transferred to Perth airport for your onward travel arrangements.